Freddy was born on May 23, 1925, and was a resident of The Bronx for most of his life. When he was 9 years old, he suffered an accident during a stickball game, in which he lost the use of his right eye. From about 1988, until his death, he was an unofficial promoter for the Yankees. Schuman carried a frying pan with a shamrock painted on it, which he said "Brings 'em luck." Fans were encouraged to bang on the pot with a spoon to make noise. The pot made a distinctive sound that echoed throughout the stadium and could be heard in the background during TV broadcasts. One of his pans is on display at the National Baseball Hall of Fame along with another at the Yogi Berra Museum & Learning Center in New Jersey. Schuman also carried a number of colorful hand-painted signs adorned with messages to encourage the team and the fans. The signs usually began with "Freddy 'sez'". Some Freddy messages included "Again & Again Yankees Prove They Are Great", and "Fans, We Got To Help Yankees Out Of Slumps". Sometimes, Schuman would give the sign to a lucky fan at the end of a game. Schuman can be briefly seen in a baseball themed MasterCard commercial that aired during the 2007 Major League Baseball Home Run Derby. He can also be seen for a few seconds near the end of House of Pain's 1992 music video for their hit single "Jump Around". Schuman himself has claimed his tickets circa 2003 were sponsored by Modell's Sporting Goods. After his death in 2010, Schuman can be seen briefly in a Nike Boom commercial, featuring Craig Robinson and Robinson Canó. 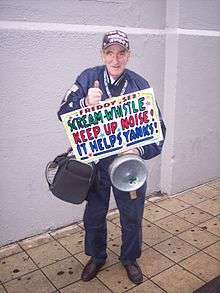 ↑ "RIP: Freddy Sez, the old pot banging guy at Yankee Stadium - Big League Stew - MLB Blog - Yahoo! Sports". Sports.yahoo.com. 2010-10-17. Retrieved 2015-06-11. 1 2 Bronx Baseball Daily. "New York Yankees: The Legend of Freddy Sez". Bleacher Report. Retrieved 2015-06-11. 1 2 Botte, Peter; Bill Hutchinson (2010-10-17). 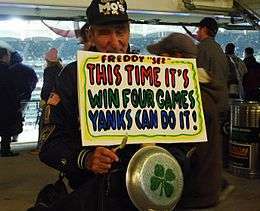 "Freddy 'Sez' Schuman, a Yankee Stadium staple for last 20 years, dead at age 85". New York: NYDailyNews.com. Retrieved 2010-10-18. ↑ Jonathan Eiseman. "Longtime Yankees Superfan Freddy "Sez" Dead at 85". NBC New York. Retrieved 2015-06-11. ↑ Benjamin Kabak (2010-10-17). "Freddy Schuman, long-time stadium stalwart, passes away - River Avenue Blues". Riveraveblues.com. Retrieved 2015-06-11. ↑ Klopman, Michael (2010-10-18). "Beloved Yankees Fan Dies At 85". Huffington Post. ↑ Joe DeLessio. "Freddy 'Sez,' 1925–2010 - The Sports Section". Nymag.com. Retrieved 2015-06-11. ↑ "Manhattan Mourns Passing of Freddy "Sez"". GoJaspers.com. Manhattan College. 2010-10-18. Retrieved 2010-10-23. ↑ "Fordham Athletics Mourns the Death of Freddy `Sez' Schuman". FordhamSports.com. Fordham University. 2010-10-18. Retrieved 2010-10-23. ↑ Begley, Ian (2010-10-18). "Freddy 'Freddy Sez' Schuman dies at 85". ESPN New York. Retrieved 2010-10-18. ↑ "Moment of silence for Freddy "Sez" - Yankees Blog - ESPN". Espn.go.com. 2010-10-18. Retrieved 2015-06-11.